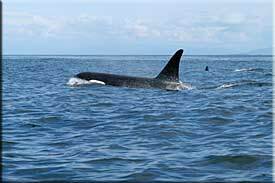 For many the sight of wild Orcas makes their trip to the Gulf Islands an unforgettable experience. Humpback whales and Minke whales may also be seen as well as porpoises. During the summer months the local “pods” are in the area most days so if you happen to be in the right location you may see a fantastic show. Another alternative is to go on a whale watching tour with one of the many licensed operators. Whatever you do, please follow the guidelines set out for the protection of these magnificent animals. Please view Be Whale Wise – Marine Wildlife Guidelines for Boaters, Paddlers and Viewers if you plan on being on the water when whales are present. WhalesBC – A great source of information about our resident whales.